Folks probably know that I make video games as part of Future Proof Games, but maybe not what we’re doing at the moment. Many, many (many) years ago, Gregory made “(I Fell in Love With) The Majesty of Colors”, a very sweet Flash game about balloons and drowning. As the site stats geek for FPG, I can tell you “Majesty” remains pretty damned popular. (Hell, it just got linked by Buzzfeed a few days ago.) It’s an evocative game that continues to appeal to folks wanting to explore the soft feelings of a big, weird, sessile alien. Problem is, Flash is finally actually dying — no phone/tablet can run it, and some browser configurations require user action before it’ll run Flash. So we’re bringing “Majesty” to modern devices: Android, iOS, and Windows/OSX/Linux. And holy crap, this game feels great on a phone; moving the tentacle with your finger just feels real in a way that the tiny, mouse-controlled Flash version doesn’t. I’m excited to test it on tablets. Something that would really help the game be successful is if the desktop versions can launch on Steam. For us to do that, we need to make it through Steam Greenlight. If you have a Steam account, take a moment and vote for “Majesty”. Something that would put a smile on my face would be if you left a cheery comment on the Greenlight page. Y’all know how the internet can be. Right now. Over there on Steam. Greg and I have a D&D game tonight. He’s the sucker that’s GMing, so I’ll be staring at stats on my phone and checking email all night while absentmindedly rolling dice for my diva Avandra-worshiping Shardmind ardent. 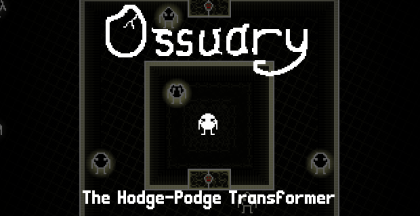 I promise, not every one of my blog posts from now on is going to be about Future Proof, but we’ve released a small companion game/prelude/demo to Ossuary! It’s weird. It’s fun. It’s… salty. Go play “The Hodge-Podge Transformer” while you wait for me to post some Iceland photos. …Yeah, I said it. What, then? You’ve already waited 4 months; what’s one more day?